Berlin, October 8, 2014 – Native Instruments today introduced CARIBBEAN CURRENT – a new MASCHINE Expansion that pairs the sounds and rhythms of traditional Caribbean music with a modern, club-oriented aesthetic. CARIBBEAN CURRENT features all-new patterns, custom MASSIVE presets, a dub siren, and exclusive kits created and inspired by artists in the upcoming NI documentary ‘Sabroso! A Road Trip to Colombia’s Caribbean Coast’. CARIBBEAN CURRENT is available now at the NI Online Shop and runs in the MASCHINE 2 software on MASCHINE STUDIO, MASCHINE, or MASCHINE MIKRO. A compact version for iMASCHINE is also available via the in-app store. CARIBBEAN CURRENT’s kits are inspired by artists from all around the Caribbean, providing producers with a tour of traditional music styles from the region, including dancehall, dub, soca, reggaeton, moombahton, and more. The patterns and projects of this MASCHINE Expansion pull from these rhythmic traditions, allowing producers to create grooves outside of the familiar four-on-the-floor feel. Each drum and percussion sound was carefully processed to deliver a modern club sound, adding a fresh sonic quality to the infectious rhythms. CARIBBEAN CURRENT also provides a selection of melodic elements, combining traditional Caribbean instruments with modern synthesis and sound design. High-quality samples of steel drums, melodica, and accordion, plus new presets from NI’s MASSIVE synth and sampled leads allow producers to create melodies with MASCHINE’s 16 high-sensitivity performance pads. Dub chords and vocals provide additional instrumentation for groove production. And a Dub Siren special kit adds a staple of Caribbean music to this new MASCHINE Expansion. A condensed version of CARIBBEAN CURRENT is also available as an iMASCHINE Expansion, for creating beats on-the-go. The iMASCHINE Expansion features three projects, four drum kits, and three instruments. Tracks can be exported to MASCHINE STUDIO, MASCHINE, and MASCHINE MIKRO for completion. 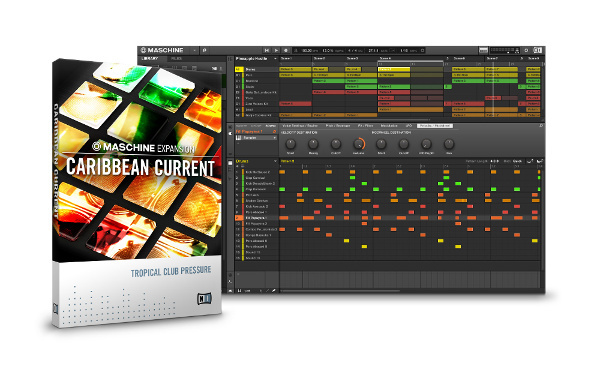 CARIBBEAN CURRENT is available now at the NI Online Shop for $49 / 49 € / £44 / ¥ 4,800 / AU$ 79 and runs in the MASCHINE 2 software.